My kids are halfway through their summer vacation and I am already thinking about what they need to go back to school. My daughter and her friend love writing in their BFF summer notebook so I thought my girl would like a washi tape composition book. She can use it at school or as a diary during the school year. Be sure to read through the entire post because I have a video of me making the washi tape composition book at the end of the post. 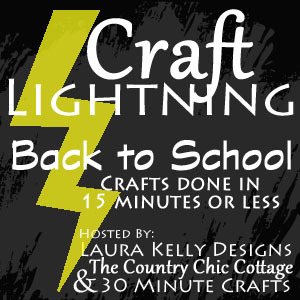 This quick project took less than 15 minutes to make so it is perfect for this month’s Back To School session of Craft Lightning. 1. Cut the cardstock. I bought my composition book at Dollar Tree and the measured dimensions were slightly smaller than specified on the notebook. Trim both pieces of cardstock to be the height of the notebook. For the white cardstock, I measured from the right side of the notebook to just left of the right edge of the black spine. For the pink cardstock, I left it as 8.5 inches wide because it covered the back cover and the entire black spine. My white cardstock measured 6 3/4 inches x 9 5/8 inches and the pink cardstock measured 8 1/2 inches x 9 5/8 inches. Be sure to measure your composition book because the size varies by brand. 2. Add washi tape to the white cardstock. I used an assortment of Scotch Expressions washi tape. The washi tape was lined up in a pattern and added one at a time to the white cardstock. The ends of the washi tape go off the edge of the cardstock. 3. Fold the washi tape ends over to the back of the cardstock. The quickest way to pick up each piece of washi tape was to get each piece to stick to my finger and then use that to fold the washi tape down. 4. Adhere the pink cardstock to the back cover. Add ATG adhesive to the edges and an X of adhesive in the middle of the cardstock. Line the cardstock up with the edge of the composition book and press down. Add extra adhesive near the spine and press down. 5. Adhere the washi taped cardstock to the front cover. I added ATG adhesive to the composition book cover and the back of the cardstock. Maybe a little overkill but I want that paper to stick. 6. Trim the corners of cardstock with scissors. This easily rounds the corners of the composition book without using any other tools. Here’s a time lapse video of how I created this washi tape composition book. A huge thank you to Christine of Where The Smiles Have Been for inspiring me to get this video done. This was the first time I have recorded and edited a video on my iPhone 6. If the video appears a little grainy, hover over the video and click on the gear at the bottom right of the screen. Then select 720p HD. I only customized the front cover of the composition book but you could also customize the back cover with washi tape. This craft lightning project was fun to make and the best part is that my daughter loves her new vibrant washi tape composition book! Back to school seems like it is just around the corner so I’m going to squeeze the most fun I can out of these last few weeks before school starts. Happy crafting. This is so cute and easy. Thank you for sharing! Hi! I’m a high schooler who needs a notebook that will last through the wind, rain, and being thrown into backpacks. Do you think I could put some heavy duty tape over the whole thing? Thanks! Hi Amanda. There is a lot of cool patterns on duct tape these days so you could just use that instead of washi tape to have it be more durable. Cute idea Kelly! Love the video! There’s not much more I love than a good washi tape project, and I LOVE how your notebook turned out! I’ve always just adhered the washi tape directly to the cover of plain craft notebooks, but I like the cardstock technique better! Next time I need a new notebook, I know exactly what I want to do! Also, your video is awesome!! Forget back to school…I want this for myself! Thanks for the great tutorial! You are welcome Steph! I want one of my own too but in different colors. Those are my daughter’s favorite colors. I think my book would be all different shades of blue. I thought you added washi tape to the existing cover, but I really liked the idea of adding a new one completely! Thank you Brittany! The reason I added a cover instead of putting tape on the existing cover is because a lot of my washi tape has transparent areas. You would have been able to see the black and white of the original cover through it. Thank you Marilyn! It was a fun to make and I loved using my washi tape stash. LOVE the video! How cute and easy. Helps so much with seeing the directions actually being done. Thank you Rachel! I love to watch other people scrapbook and craft. Everyone has such different styles and there are always little nuances that get lost in written directions.